I really didn’t know what to name these bars as they can be eaten for breakfast, as a snack or even dessert! They are so yummy and wholesome and are suitable for any time of day. Plus I don’t know if you’ve noticed a running theme I’ve got going on but I really do love how versatile oats can be! They are super easy to make and can be kept in the freezer for around a month or in the fridge for up to a week. They could probably last a bit longer I’ve just not been able to leave them long enough to find out! Seriously though they look good but taste even better…you won’t want to eat another cereal bar again! The other great thing about them is that you can literally throw in whatever you have at home, I’ve made these a few times now and each batch has been different depending on what I’ve got in or what needs using up. 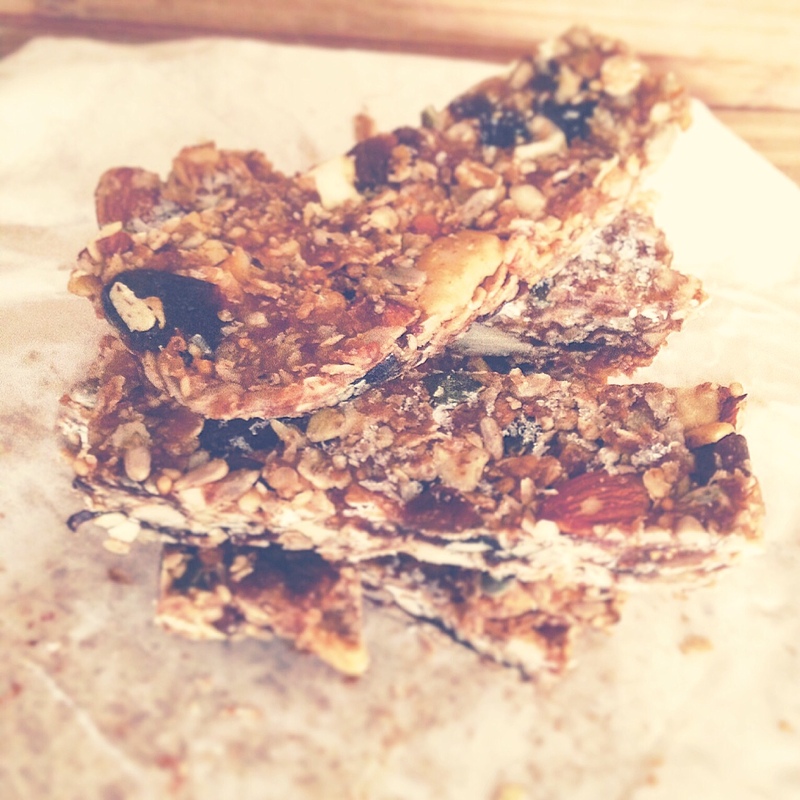 As these bars are made up of healthy fats, protein and slow release carbohydrates they are perfect as a pre work out snack and the oats will keep your energy levels steady throughout your gym sesh. Some of the extra’s I have been putting in are, sunflower and pumpkin seeds, sultanas, apricots, prunes, goji berries and figs. Bigger fruits like figs and apricots would need to be chopped into chunks. You could even put in cacao nibs to add in some extra antioxidants and vitamins (adding some cinnamon and natural maple syrup would be quite nice to have in winter too). First you need to roast or bake the oats and nuts in the oven for just 10/15 minutes or so until they start to turn golden (around 180°c) I wouldn’t do this under the grill as it can burn the oats very easily. Whilst they are in the oven, put the dates into a bowl and cover with some boiling water to soften. Once the oats and nuts are nice and toasty put all of the oats and about 1/3 of the nuts into a large bowl. Then with the remaining 2/3 of the nuts put into a food processor and give a quick blitz until they are chunky (but not fine like crumble). 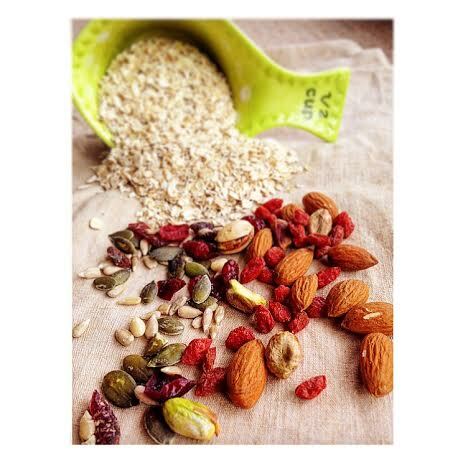 Add the chunky nuts back into the bowl with the toasted oats along with any extra’s you have chosen. Then drain the dates and put into the food processor and blitz until it becomes very sticky and will start to clump together into a large ball. Add this to the oat mixture. Next you need to melt the coconut oil over a low heat and then stir in the peanut butter until it becomes runny (if you like things sweet you could always add some maple syrup or honey at this point). Once fully melted and smooth drizzle this over the oat and nut mixture and combine thoroughly, making sure all of the oats are coated in the dates/peanut butter to ensure they stick together. Line two loaf tins with parchment paper and divide the mixture between them, putting a couple of spoonfuls in at a time and pressing down with the back of a spoon until it starts sticking together like you would the base of a cheese cake. Once they feel nice and compact pop them in the freezer for an hour and then slice into bars to eat later or even into squares to enjoy with coffee. I’ve even crumbled up a slice over frozen yoghurt as a healthy pudding too!